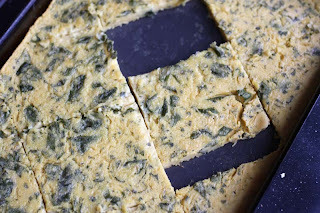 A2K - A Seasonal Veg Table: It's Wild Garlic, but is it Farinata or Socca? or is it Wild Garlic Socca?! 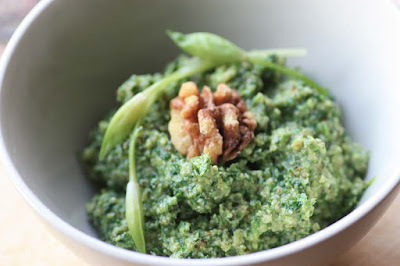 I've made flavoured variations of a chickpea pancake before, but was reminded of this deliciousness after reading a fellow bloggers blog and thought to myself wouldn't it be interesting to incorporate some wild garlic into the batter. I was confident that the outcome would be good, as in this past I've topped my chickpea pancakes with fresh herbs, roasted tomatoes and aubergine, even za'atar and enjoyed it. Chickpea pancakes are really easy to make as it has three main ingredients: Chickpea flour, also known as besan, or gram flour, water and a little olive oil. Once you have poured the batter into the pan, you can can bake them plain and simple; or for a flavoursome version you can top the batter with pretty much anything, but fresh herbs, sun-dried tomatoes, olives, feta cheese and sunny vegetables such as red and yellow peppers, courgettes and aubergines work particularly well. 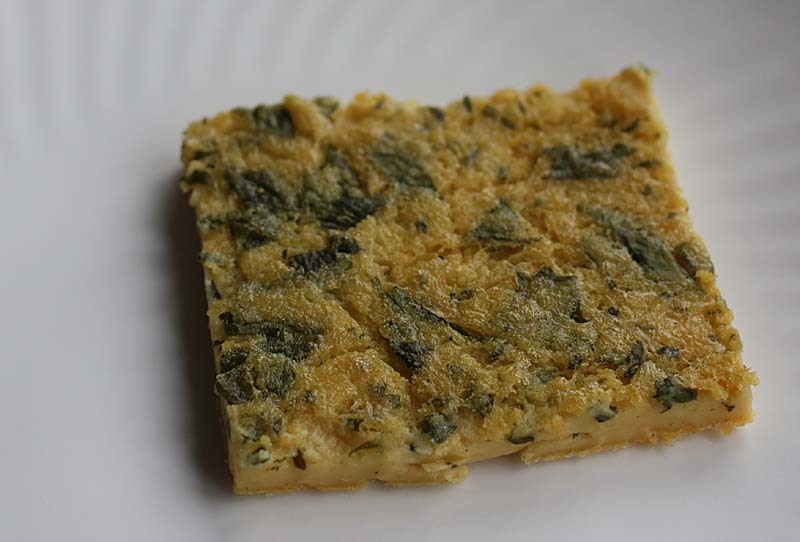 Its upon baking that the chickpea batter is transformed into a thick eggy pancake but without any eggs, I guess you could describe it as a vegan frittata. Whilst posting for this blog I started reading more about this chickpea pancake and was suddenly rather confused as to whether I was making the Italian Farinata or the French Socca. You see both Farinata and Socca are a thin, crisp unleavened pancakes or crêpes made essentially from chickpea flour. Well I know my version is not authentic, so its probably neither, but I've made it with a happy nod to both cultural cuisines. I also had a go at making some Wild Garlic Crisps. I simply deep fried the washed and dried leaves in some vegetable oil. This is not something I'd recommend to the light hearted as the wild garlic spits and puffs up on contact with the hot oil, then it pops making you jump a little. The Wild Garlic Crisps lost their flavour cooked this way, so were just okay. 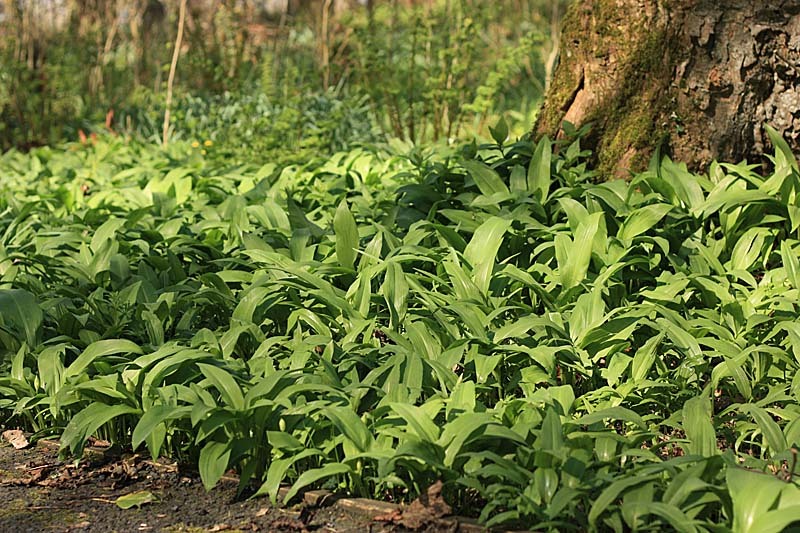 I think I'll have a go at making some Wild Garlic Tempura next time. Whisk the water into the chickpea flour a little at a time so as to avoid lumps. Add the wild garlic and season to taste. Let stand for at least 2 hours, or overnight if you have the patience. 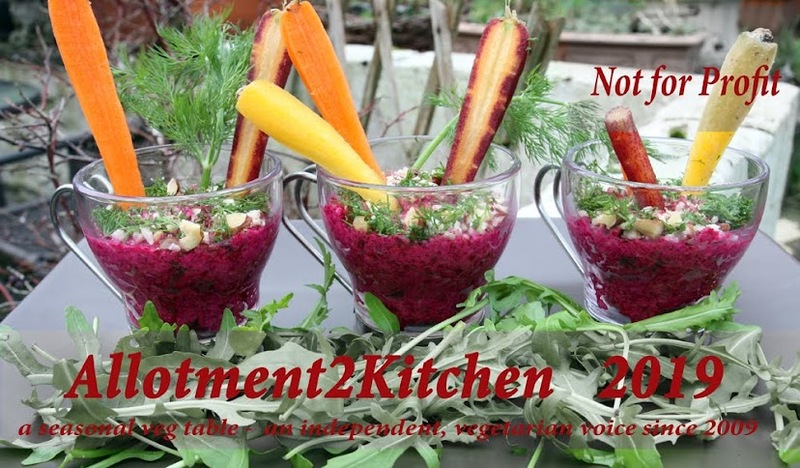 *Although I have not tried it, I've read that you can make these on the stove top too. I am guessing you could heat a large frying pan or cast iron pan. Heat the pan and drizzle in some olive oil. Pour in the batter and allow to fry until the bottom is golden brown. Flip and cook the other side until golden. Ciao, spero che tu riesca a tradurre. complimenti per il blog, ti seguo da un pò. Volevo mandarti la ricetta originale della Farinata Genovese: 300g farina di ceci, 1 litro acqua, sale. Rimescolare bene per eliminare i grumi, lasciare riposare per 3-4 ore, levando la schiuma. Versare l'olio di oliva, 1/10 della miscela farina + acqua. Rimescolare molto bene. Il forno deve essere molto caldo, 250 gradi celsius, far cuocere finchè non prende colore in superficie. Pepare. Ciao, spero ti faccia piacere. 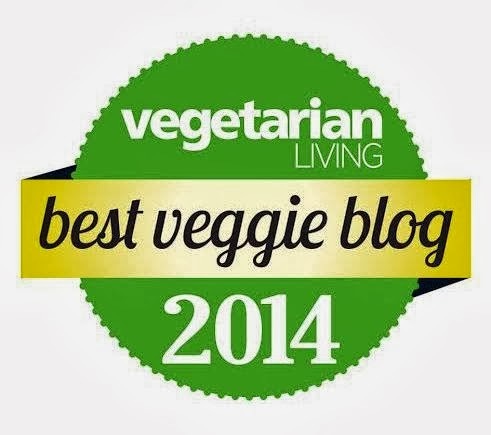 I am loving your wild garlic adventures, fantastic! I like the idea of garlic hummus. A bit disappointed that the garlic crisps lost the garlic taste as they look fab. All of it sounds delicious. 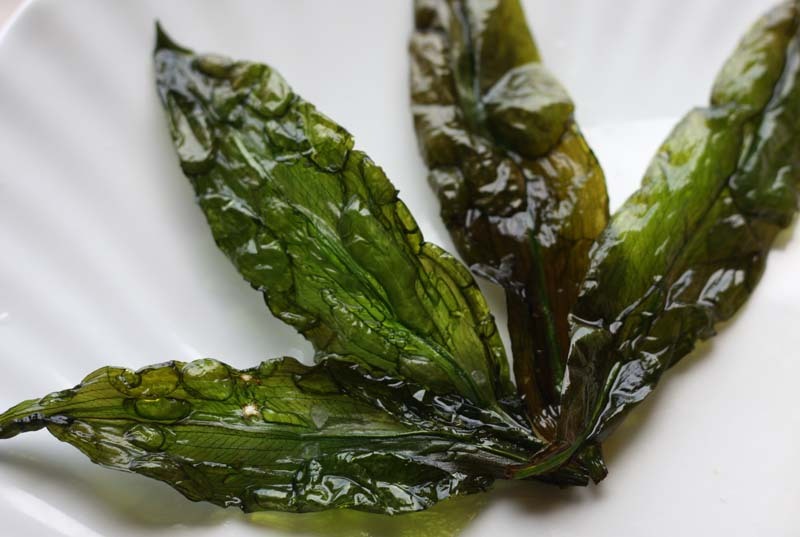 And wild garlic tempura without doubt will be great. I have eaten leaf tempura in Japan with a wafer-thin dough around them and that was soooo good and crispy, so I guess wild garlic must be really good, too. I must look out for a patch of wild garlic like that one in your photo... Most people would not recognise it as a food source! This dish looks tasty! Can't wait to try it. I have translated your message so other readers can read it too. Thank you. An original Genoese Porridge recipe: 300 g chickpea flour, 1 liter water, salt. Stir well to remove lumps, let stand for 3-4 hours, looking up the foam. Pour the olive oil, 1/10 of flour + water mixture. Mix very well. The oven must be very hot, 250 degrees celsius, Cook until it takes color to the surface. I was disappointed that the garlic crisps lost the garlic taste too, but am looking forward to making wild garlic tempura. I'll share the wild garlic tempura recipe soon hopefully, though I know it won't be as light as the one your tried in Japan. The wild garlic around you must surely be flowering right now. Follow this link and you will see the star like flowerheads to recognise them. They may be a less than tender to enjoy in salads, but they should still be good for pesto and soup. there are even mopeds pulling a trailer-type-thing with another dustbin adaptation that holds hot coals to keep the socca warm! Yes I read Socca was a speciality in Nice, as I've only been to Paris and Brittany and not seen it there at al. Interesting to read it being cooked on a dustbin lid, I guess its called improvisation - I've seen Aussies use dustbin lids for a BBQ. 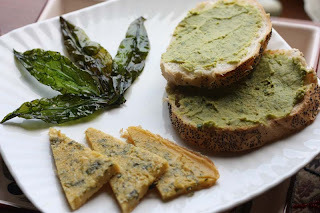 I would love to know if my version (without the wild garlic) resembles Socca at all?! I think you will like this. Let me know if you do make it and how you found it. Yum to it all! Your food is always so appealing to me Mangocheeks! I guess you have found some more wild garlic on your travels. I must go back a post or two and see. I seem to have missed a lot this week. 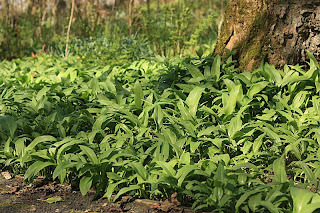 I'm laden with wild garlic this year and intend to make the most of it this week. I was just thinking about farinata yesterday! I haven't made this in ages and I love what you've done to it. I haven't had ANY wild garlic this season. Or nettles for that matter - what is wrong with me?? ?